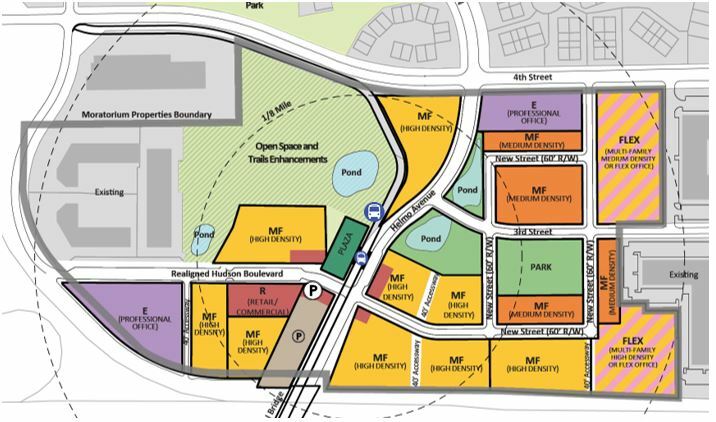 This is an overview of the Helmo Station Area Phase 4 proposed BRTOD Plan. 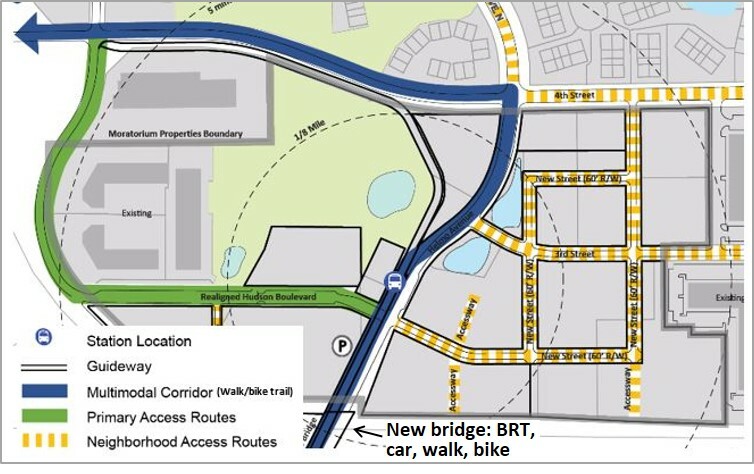 See draft plan (March 2018) and final plan (April 2018). 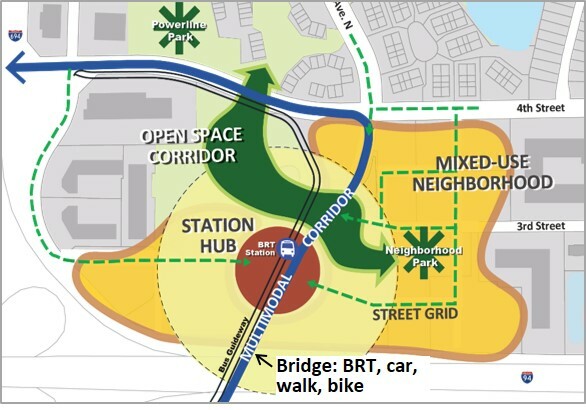 The Helmo Station Bus Rapid Transit Oriented Plan (Helmo BRTOD Plan) will serve as a traditional small area plan and policy guide for redevelopment of the area within a 1/2-mile radius of the planned bus rapid transit (BRT) station within the City of Oakdale. The BRTOD Plan process consisted of four phases, from identifying issues and concerns to establish station-specific objectives, to draft and refined concepts – each of which engaged key stakeholders including City staff, the City Council, station area property owners, and adjacent residents to gather feedback and guidance. The station location and its environment shown below are key to attracting transit-oriented development and ensuring the safe and direct access that will maximize transit ridership. 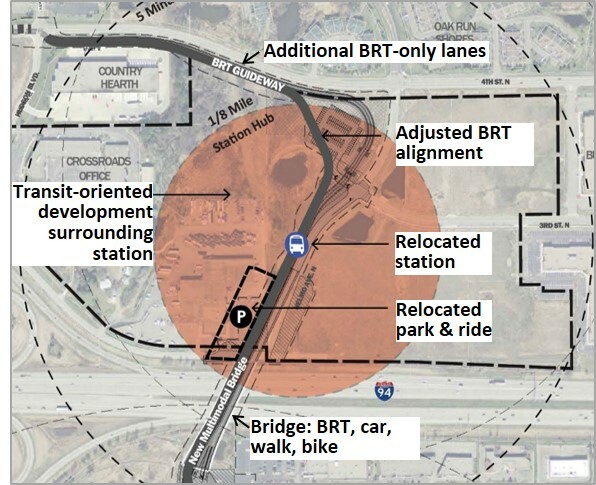 Evaluation of the preliminary engineering plans for the Helmo Station through the lens of transit-oriented development potential, station access, and stakeholder feedback, identified a number of issues that resulted in BRTOD refinements as shown in the graphic. The land use diagram below illustrates potential new development patterns and the types of station area uses. Multi-family (MF) Residential: There is opportunity for a significant amount of multi-family development with direct access to BRT. A range of housing types, including apartments and townhomes, is identified with the highest intensity at the station and lower intensity next to neighborhoods. Parks and Open Space: New parks and open spaces are centrally located to serve as an amenity for multi-family housing development and for existing neighborhoods. Retail/Commercial (R): A limited amount of retail concentrated at the Helmo Station provides daily activity and is supported by existing area residents, new multi-family and employment uses, and direct, convenient auto access from Helmo Avenue and the future Helmo Avenue/BRT bridge. Employment (E): Employment uses consist of traditional professional office and flex office, such as office/research and development/ light manufacturing, on sites visible from 1-94 and adjacent to existing office uses with direct access and visibility from 4th Street. Park-and-Ride: A limited number of commuter parking spaces is needed to serve the Helmo Station and is anticipated to be located south of the station, adjacent to Helmo Avenue/BRT bridge. The proposed circulation framework reinforces the Helmo station area as a hub for transit-oriented development, with an interconnected street grid serving autos, trucks, transit, pedestrians, and bicycles. The grid disperses traffic within the station area; improves access to development parcels; and reduces the need for excess travel lanes and capacity on Helmo Avenue and 4th Street. The intent is to provide for adequate auto traffic capacity serving existing and future development while maintaining Helmo Avenue as a three-lane roadway and 4th Street as a two-lane roadway with additional turn lanes where necessary at key intersections. Provide feedback on land use and circulation from the link to online engagement at www.thegatewaycorridor.com/station-area-planning/oakdale-helmo-station-area/ (deadline 4/15/18). The Oakdale Planning Commission and City Council will review and refine the BRTOD plan in early April and consider it for adoption in late April. See the City’s website for further details, www.ci.oakdale.mn.us/. For more on METRO Gold Line station area planning go to www.thegatewaycorridor.com/station-area-planning/.